Your Unique Selling Proposition (USP): What's the Big Picture? If you're a consultant, coach, or service professional and you face commoditization, you MUST do something to stand out in your market. You probably knew that, too. But I'll bet you didn't know that early USPs were doubly powerful, because they were visual as well as written. Why? So busy housewives wouldn’t forget the product between then time they saw it on TV at night and went shopping the next day. 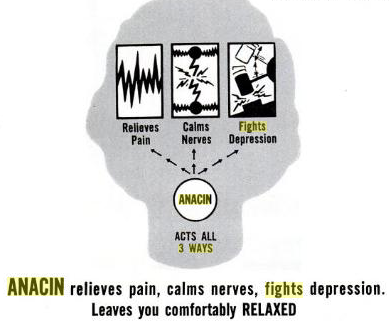 See how visually involving and convincing these graphics are? 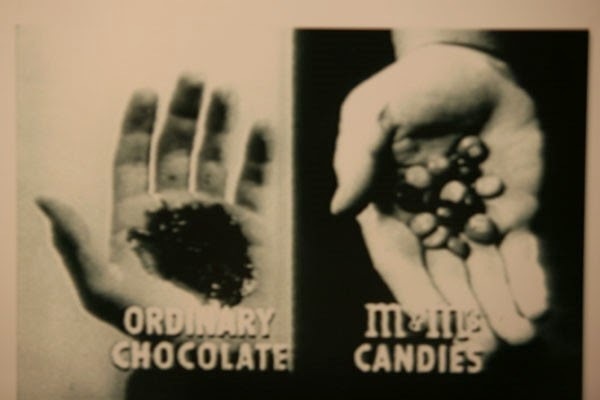 They're screen caps from TV commercials that ran in the 1960s. Plenty of blenders claim to be fast, convenient, powerful, etc. But only one -- Blendtec blenders -- proves their claims visually like this, with a fun YouTube channel. That's a USP. Plenty of sushi restaurants claim to offer yummy authentic food that will delight you. But only one -- Ebisu Sushi, in Vancouver, BC -- proves their claims visually like this, with a wall of these unique customer photos. That's a USP. Plenty of marketing tools claim to make selling easy for you. But only one -- The Selling CardTM -- proves its claims visually like this, by showing you a sales letter masquerading as a business card. Key question: How can you make your USP visual and well as verbal? That makes it doubly powerful, and can make your business doubly profitable. ... I can show you more "profit hacks" like the ones you just read in this article. Get them in my next Free Video Training Session. It's for $200k entrepreneurs ONLY, please. Can't make it to that event? 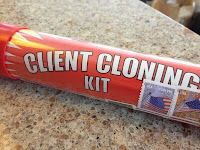 My free Client Cloning Kit can help. It's not some cheapo download -- this is a real business-building kit you can hold in your hands. Grab yours now, while you can. Do you sell consulting, coaching, or professional services? If so, you probably offer a free consultation and/or a free ezine on your web site. One word: STOP. As in, "Stop doing that. Now." Here's why. Google your competitors. Look at their websites. Look at what they're offering. See any patterns? If you're like 90% of the consultants, coaches, or service professionals I talk to, your competitors are all offering a Free Consultation, a Free subscription to Advice/Tips/Ezine -- or both. And you're probably doing the same thing. When you and your competitors all offer the same "get acquainted" options, your prospects can't tell you apart. They will shop around for the lowest price, just as they do with other commodities, like gasoline. And you'll find yourself on a fast track to oblivion. Instead, do two things: Give your free consultation a different name. Then, offer something besides a free ezine. Just as a small change to the rudder can change the course of a ship by thousands of miles, these two small changes to your marketing can change the course of your business by thousands -- or millions -- of dollars. So, stop offering Free Consultations and Free Advice/Tips/Ezine. Rename and repackage what you do. Want clients for life? People who buy from your business again and refer others? One way to get them is to make your business remarkable, so that clients literally remark about you to their friends. None of this is rocket surgery, by the way. You don't need 1,000 Facebook likes or a $30,000 web site overhaul to make it work. Just a little creative thinking. Thinking -- that's a remarkable feat which, by itself, can make your business remarkable. Can't make it to the training? My free Client Cloning Kit can help. It's not some cheapo download -- this is a real business-building kit you can hold in your hands. Grab yours now, while you can. Short answer: Free money. Because a certain percentage of your clients want to buy more and almost all of them can buy more. The only question is, are you willing to sell it to them? Academic answer: Asking people to buy more during or after the sale. Also called a bump or a cross-sell. Upsell example: Tim, a photographer in St. Paul, Minnesota, added $4,000 in extra revenue in 6 months -- on track for $8,000 extra each year -- without working any harder. He added an upsell to his wedding photo packages. In addition to low and a medium, he now offers a premium-priced package to clients. He starts every presentation with “Here’s the best package,” and then works down. No hard selling required (Tim is very laid-back). Results: More than 20% of his clients sell themselves. And Tim will bank an extra $8,000 from the same amount of work this year -- enough to fully fund his IRA and take his family on an exquisite vacation or two, with no extra work. Moral: If you don't have an upsell, you are leaving money on the table. But this is NOT about greed and you are NOT an evil 1% wannabe for offering an upsell. No. 2) better feelings (because many people want to spend more to feel good about themselves -- otherwise, we would all drive a $12,780 Nissan Versaa, the cheapest new car in America). When you offer a high-quality upsell to clients, you help them and you help yourself. Win-win.